With Runbox Files you can store all your files online and access them wherever you might be. By keeping your files centralized on the Runbox servers you can always stay synchronized, backup your data with the click of a mouse, save email attachments online for later use, and even edit them with office applications. Runbox Files is accessible in your web browser by clicking the Files menu option, and displays a folder hierarchy in the left pane and folder contents to the right. You can create new folders by entering a folder name and clicking “Create” in the left pane. New folders will be created inside the currently selected folder. Folders and files can be moved or copied by first checking the corresponding checkboxes and radio buttons and then clicking “Move” or “Copy” underneath the folder list. To rename a folder or file, first mark the checkbox next to the item and then click “Rename” in the submenu. The folder- or filename will change to an input field where you can type the new name. To save the new name, click “Save” in the submenu. New files can be uploaded via the “Upload” button in the submenu. Both files and folders can be managed using the buttons below the folder list. Note: Uploading a file that already exists in the folder will not replace the existing file. You must first rename or delete the existing file then you can upload the new file. This is only an issue with the Files web interface; uploading with an FTP client will replace the file. You can attach files from your Files area to outgoing email when composing new messages, and you can save attachments from incoming messages to Files. 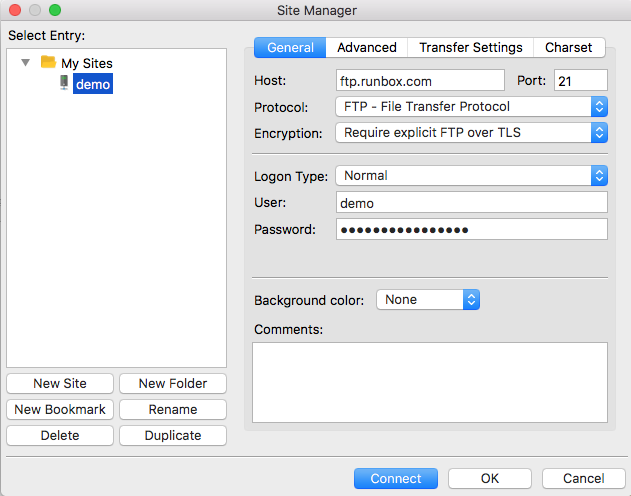 Because Runbox Files utilizes FTP you can use a dedicated FTP client of your choice to connect to the service, for instance FileZilla. If you need help with the Files feature please contact Runbox Support.